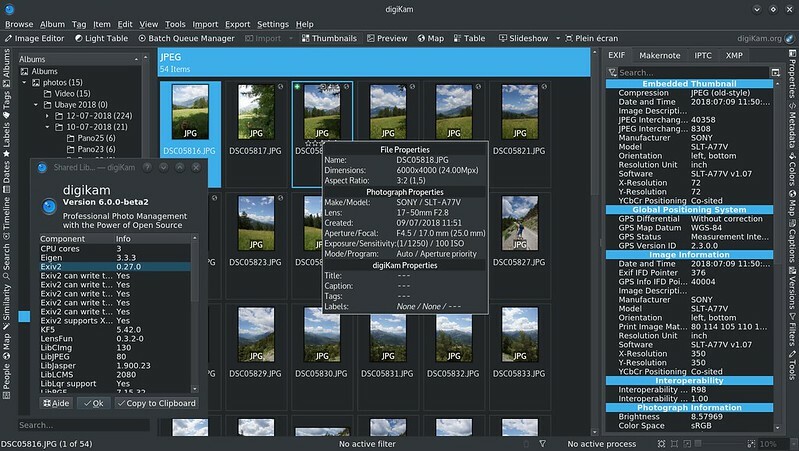 Dear digiKam fans and users, following the first beta release published in September, we are proud to announce the second beta of digiKam 6.0.0. With this new release we are following the Exiv2 project which is in release stage for their next stable release to 0.27 planed for December 2018. This library is a main component of digiKam used to interact with file metadata, like populating database contents, updating item textual information, or to handling XMP side-car for read only files. After 18 months of development, Exiv2 0.27 RC1 was finally released and digiKam has been fixed to support the new API of this library. With this new release the famous TimeAdjust tool is back to quickly patch time-stamp of items, without having to use the Batch Queue Manager workflow. Adjusting the date is a common task that wont necessarily require as complex a tool as BQM. 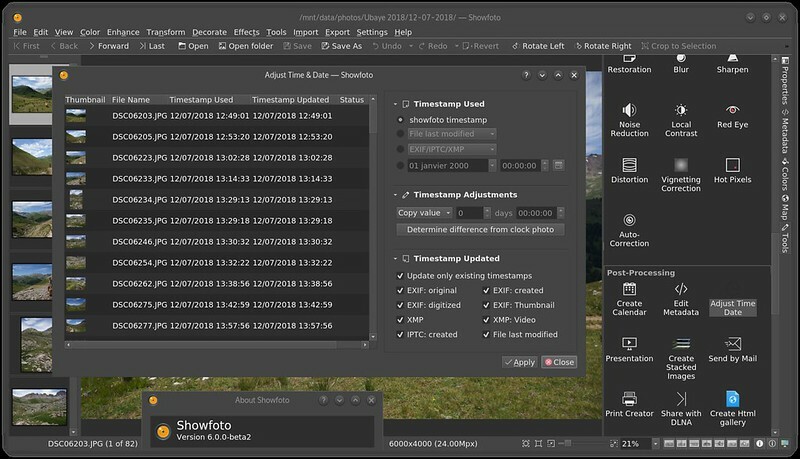 In all cases, even if TimeAdjust tool is now available everywhere in AlbumView, ImageEditor, LightTable, and Showfoto, a workflow with the possibility to fix date is always available as with previous releases. digiKam under Windows is more and more popular, and the number of reports in bugzilla has grown up seriously. 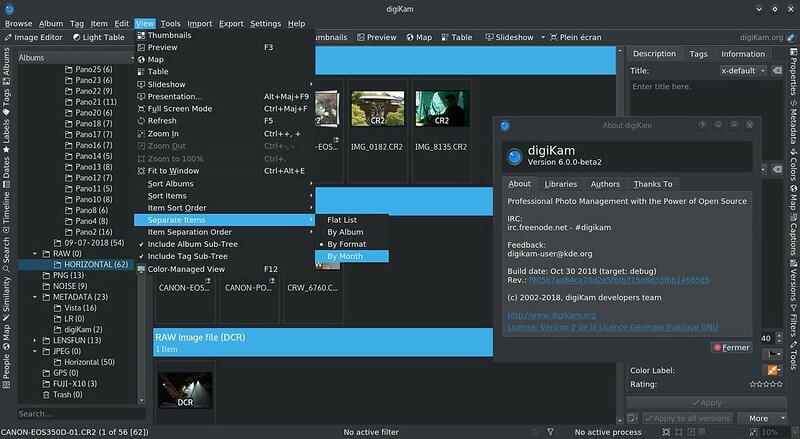 This is not to imply that digiKam under Windows is less stable than on Linux, but end users start to use more advanced features day by day and discover new dysfunctions specific to Windows. After all, the Windows version is still in beta stage since many years and a lots of problems have been already fixed. Also, the port to Qt5 with less KDE dependencies has seriously stabilized the application and we now enter the last stage to stabilize all source code on this platform well. To complete this task, digiKam is cross-compiled for Windows under Linux through MinGW (thanks to MXE project) and we include a special package dedicated to catch all technical information generated when a crash occurs, and to include better C++ exception support. DrMinGW is the tool dedicated to this task, similar to crash-course used under Linux to post debug traces in a report when a problem appears at runtime. This will speed-up the investigations in the future to process Windows bugs entries, without having to ask end-users to install a debugger and run the application in it. A recent example of DrMinGW feedback running digiKam under Windows can be seen on this file, with a clear crash located in Exiv2 shared library. 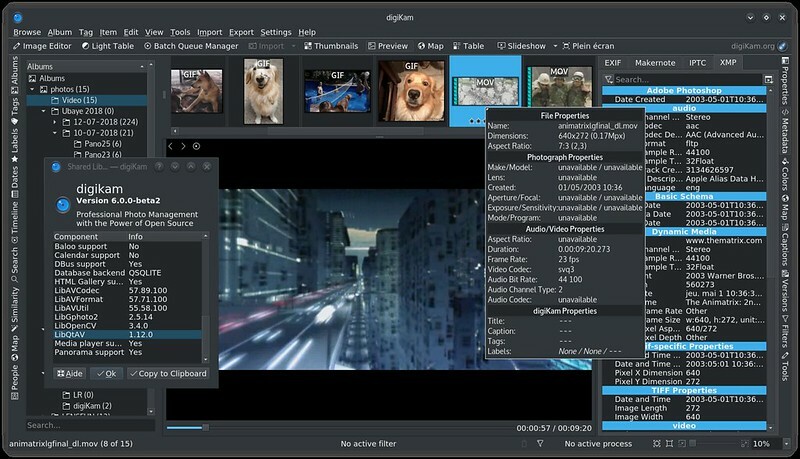 digiKam has the capability to play video files as well, without requiring an extra video player and dedicated codecs (thanks to FFmpeg and QtAV frameworks). One major dysfunction reported with previous beta release was about the embeded video slider used to jump into the stream contents which do not work anymore. This regression, introduced by changes in QtAV API require a long investigation to restore the feature. With this release, the Album management gets a new feature: separating icon-view items by properties. The default option does not separate items and provides a flat list. The new model can show album contents, automatically separated using virtual sub-albums, accordingly by mime types (RAW, JPEG, PNG, TIFF), or by the month they were shot in. To use this feature, go to the View/Separate Items menu entry. With this release, 208 new files have been closed since 6.0.0 beta1. The total files closed for next 6.0.0 final release is more than The reports already closed due to new implementations are more than 550 files, but nothing is completed yet before the final 6.0.0 release. In parallel to purging pending files in bugzilla, the whole digiKam source code (1.2M lines of C++ code) is parsed by three static source code analyzers (open-source): Clang scan-build, CppCheck, and Krazy. We have reduced to the minimum all reports generated by these tools and discovered some important in-deep dysfunctions. This permit also to review automatically all code written by students, before to transitioning implementations to production. As we already said at 6.0.0-beta1 announcement, due to many changes in database schema, do not use this beta2 in production yet and backup your database files before testing it. It’s recommended to try this beta2 with a small collection of items first, and to add new photo and video step by step. Thanks to all users for your supports and help during the beta stage. We plan one other beta release during this year, to finaly release the 6.0.0 in December. digiKam 6.0.0 beta2 source code tarball, Linux 32/64 bits AppImage bundles, MacOS package and Windows 32/64 bits installers can be downloaded from this repository.